raleigh Randonneur 531 what max size tires? 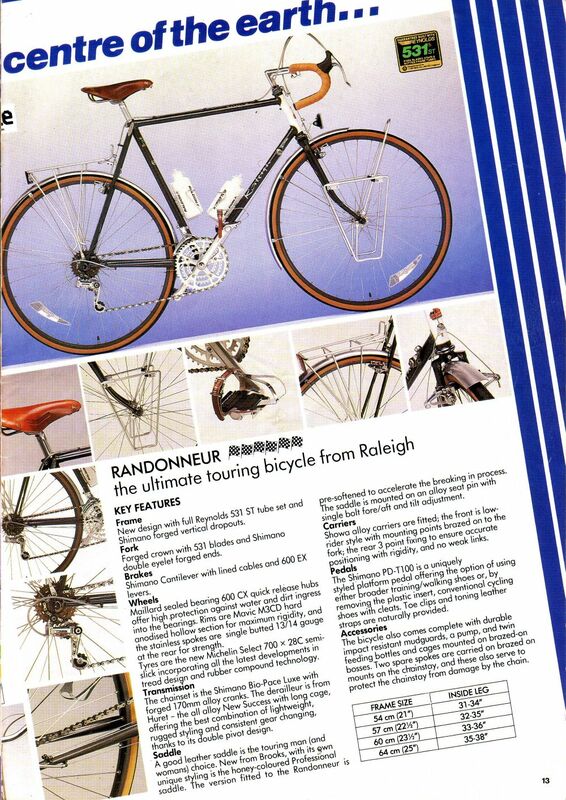 I just bought a raleigh Randonneur 531 and it currently has 32mm tires, what l was wondering is if it will fit a 37? does anyone know what the max size tires on a raleigh Randonneur 531 is? Whip out your allen wrenches and use them as feeler gauges to see where the tightest spot is between the tires, brake calipers, and frame tubes. If you have at least 5mm of clearance to the underside of the brake calipers, there's a chance you can run 37s. Hello Ninalykin, Welcome to the forums. At this point it may, unfortunately, be a trial and error sort of thing. I like Scott's idea. Where do you live? It is a longshot but maybe somebody lives near you and you could meet up and try their wheel/tire combo. Personally I find even x32 tires to be a bit too fat for my taste. The 87 Randonneur came with 700x28c. I concur, and one of these just went on my "gotta find one list". You might be able to fit 37s on there but I doubt it will fit with fenders. I'm not an expert though, just someone who puts fat tires on roadbikes. That is a really neat model, and I'm intrigued by the plastic inserts they offered for the pedals. Based on the second picture, I wouldn't get too optimistic about larger tires, though. Looks like the chainstay clearance is already pretty close. This is simply a brilliant idea. I will have to file this one away for when I might need it someday. ThermionicScott, you win the forum today. I came here with just that problem to be solved, and you nailed it. It's one of those ideas that seem really obvious after someone's shared it. Thanks! Glad to help! Of course, real feeler gauges would be better, but most of us already have 3, 4, 5, 6mm allen wrenches lying around. +1. But how much clearance DOES one need? What's a safe margin? I think if your wheels are true and have good tension (or you are handy with the spoke wrench you keep in your tool pouch ), you can get away with less clearance. 5mm is probably a good minimum for most people, but I dunno.